If a straight lumbar spine articulated with the sacrum, it would consequently be inclined forwards. To restore an upward orientation and to compensate for the inclination of the sacrum, the intact lumbar spine must assume a curve. This curve is known as the lumbar lordosis. A normal lumbar lordosis is characterized by an average lumbosacral angle of 39° - 53°., the results depend on how the lumbosacral angle is measured and there is an enormous difference in lumbosacral angle over patients. However, when the curvature of the lumbar spine is very pronounced, it refers to hyperlordosis or swayback, this means that the lumbosacral angle and the lumbar index (the chord of the lumbar lordosis) increase. In addition to the bones, ligaments, muscles and vertebral discs have also a key role in lordosis curvature. Without muscle action, the performance of pelvic girdle would not have sufficient stability. Central stabilize of the vertebral column is supported by special muscles such as multifidus, transversus abdominis and internal muscles in the trunk. They provide stability of vertebrae in a focal form and provide also segmental stabilization by controlling motion in the neutral zone. The neutral zone can be regained to within physiological limits by effective muscle control. Women have less vertebral wedging in the lower thoracic and upper lumbar vertebrae, they have relatively greater interspinous space and larger inter facet within lumbar hyperlordosis in. These anatomical features could explain the altered vertebral morphology predisposing to pregnancy. Women also have a less kyphotic posture of the upper and the lower thoracic area than males. Furthermore, the trunk’s center of mass is maintained in an approximate sagittal alignment with the hip thus reducing biomechanical load and facilitating spinal extension. There is an advantage of this deeper lordosis- less kyphotic female spine because there is a larger superior-inferior space for the human fetus. The downside of this morphological feature is the resultant size reduction of the intervertebral foramen which in turn may contribute to low back pain commonly experienced in pregnancy. Low back pain is a common health problem in our society. Most people will experience low back pain at some point in their life. The lifetime prevalence of low back pain is reported to be as high as 84% and best estimates suggest that the prevalence of chronic low back pain is about 23%, with 11-12% of the population being disabled by it. All age groups are affected by low back pain. An increase in lordotic angle proportionally increases the shearing strain or stress in the anterior direction and shifts the center of gravity anteriorly. This increased angle and stress are thought by some to be associated with poor posture and back pain. From a biomechanical point of view, the accentuated lumbar lordosis is associated with an increased prevalence of low back pain. However several studies have concluded that low back pain is not directly related to lumbar hyperlordosis. There are factors that contribute to a higher amount of lumbar lordosis. These etiological factors, like the weakness of the trunk, short back muscles, weak thigh and hamstrings, etc. in turn can cause low back pain. It is important to mention that not solely the lumbar hyperlordosis is the causing factor for low back pain.It is thus not reasonable to conclude that there is a relationship between LBP and the size of the lumbar lordosis. On the other hand, it is likely that trunk muscle weakness can influence the shape of the lumbar lordosis and might be a cause of LBP. The multifidus, transversus abdominis and internal muscles in the trunk act late in patients suffered from hyperlordosis. There is a correlation between the weakness of the trunk muscles and an increased lordotic angle, which can be a cause of low back pain. Weakness in any of the muscles of the lumbar-pelvic belt can follow pelvic rotations and diversions of back-arc by impairing muscular balance in this area and thus a person can be prone to musculoskeletal disorders. 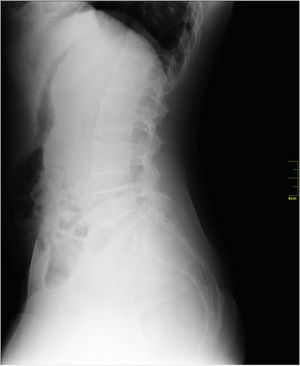 Lumbar hyperlordosis is known as ‘swayback’ or ‘hollow back’. There is an increasing recognition of the importance (functional and clinical) of lumbar lordosis. It is a key feature in maintaining sagittal balance. It has been claimed that flattening or loss of normal lumbar lordosis is an important clinical sign of back problems. People with low back pain have reduced lumbar ROM and proprioception. Their stabilizing muscles act more slowly compared to people without LBP. Normally the stabilizing muscles are activated before the movement is initiated, but in people with low back pain, this contraction is delayed. It’s essential to make the difference between specific and non-specific low back pain because they need a specific treatment. When there are no red flags and no clear underlying pathophysiology, we talk about non-specific low back pain. Weight loss, without an indication. 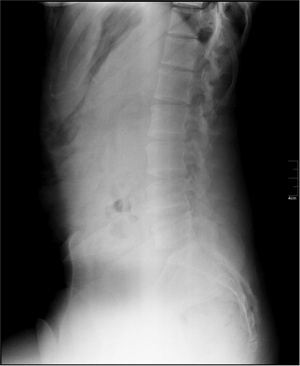 Radiographs can be used to measure the lumbar angle. Between the inferior endplate of T12 and the superior endplate of S1: This one had the best intraobserver reproducibility. There are identified six main domains relevant to the assessment of patients with low back pain: pain symptoms, function, well being, work disability, social disability and satisfaction with care. These suggestions were made by a group of low back pain experts and were accepted by the spine-research community. The strongest risk factor for future low back pain is a previous low back pain. So primary intervention does not seem to be a realistic aim. There are not many strong and alterable factors found, which can cause low back pain for the first time. Only exercise intervention seems to be effective. and when you combine it with education, it also appears to have a positive effect. Other interventions, including education alone, back belts, and shoe insoles, do not appear to prevent LBP. An inspection can provide valuable information on muscle weakness. Therefore, it is recommended not to skip the inspection. We look at the depth of lumbar lordosis and any sagittal deviations. The flexible ruler may be of clinical value in the assessment of exercise or postural adjustments attempting to increase or decrease a patient's lumbar lordosis. In such an assessment, the flexible ruler would only have to indicate an increased or decreased angle. The patient remains in the normal standing position while measuring the lordotic curve. The flexible curve should be pressed against the spinous processes of the lumbosacral spine and the points that intersected the adhesive markers have to be recorded. The points that intersected L1 and S2 could be marked and a line drawing between them. Since lumbar hyperlordosis is just a contributing factor in producing low back pain it is needed to look further for other causes. When serious and specific causes of low back pain have been ruled out it is suggested to follow NICE guidelines for early management. encourages the person to be physically active and continue with normal activities as far as possible. Include an educational component consistent with this guideline as part of other interventions, but do not offer stand-alone formal education programmes. Take into account the person's expectations and preferences when considering recommended treatments, but do not use their expectations and preferences to predict their response to treatments. First medication option should be regular paracetamol. Offer non-steroidal anti-inflammatory drugs (NSAIDs) and/or weak opioids (codeine and dihydrocodeine) when paracetamol or NSAIDs provided insufficient pain relief. Give due consideration to the risk of side effects from NSAIDs, especially in older people and other people at increased risk of experiencing side effects. Surgical intervention can be considered when the lumbar lordosis curve is severe, the conservative treatment alone failed and if there are signs of neurologic involvement. Signs of neurologic involvement are the loss of sensory perception of touch, loss of reflexes and loss of muscle fiber recruitment. Surgical correction can be done anteriorly and posteriorly. First, it is needed to be certain that there are no indications for surgery. It’s beneficial to start with physical therapy in combination with medication. Physical therapy management should be aimed towards improving the patient’s ADL and reducing low back pain. As discussed before, the factors contributing to the LBP can be very diverse, therefore is important to know what the causing factors are to set therapeutic goals that are realistic for the patient. Exercise therapy, including supervised exercises, appears to be slightly effective at decreasing pain and improving function in adults with chronic low-back pain, particularly in healthcare populations. Patients with an acute outburst of low back pain who received exercise therapy in addition to the medical management had fewer recurrences over a long time. Decreasing the extension forces on the lumbar spine must be the purpose of the exercises. This can result in a decreased lumbar lordosis. Exercises should be done on a regular basis to reach maximum effect. • 3 sessions per week: about 1 hour. • Duration of each exercise: 8 to 10 seconds in each set. • Protocols were started with 1 set of 10 repetitions at starting baseline and by improving performance and patients’ compatibility with training, all eventually ﬁnished with 3 sets of 20 repetitions at the end of protocols. The patient lies on his back with knees bent, feet ﬂat on ﬂoor. Cue: Flatten the small of your back against the ﬂoor, without pushing down with the legs, hold for 5 to 10 seconds. The patient lies on his back with knees bent and feet ﬂat on the ﬂoor. Cue: Slowly pull your right knee toward your shoulder and hold 5 to 10 seconds. Lower the knee and repeat with the other knee. The patient begins as in the previous exercise. Cue: Pulling right knee to chest, pull left knee to chest and hold both knees for 5 to 10 seconds. Slowly lower one leg at a time. Cue: Slowly curl your head and shoulders off the ﬂoor. Hold brieﬂy. Return slowly to the starting position. The patient starts in long sitting with toes directed toward the ceiling and knees fully extended. Cue: Slowly lower the trunk forward over the legs, keeping knees extended, arms outstretched over the legs, and eyes focus ahead. The patient places one foot in front of the other with the left (front) knee ﬂexed and the right (back) knee held rigidly straight. Cue: Flex forward through the trunk until the left knee contacts the axillary fold (armpit region). Repeat with right leg forward and left leg back. The patient stands with both feet parallel, about shoulder’s width apart. Attempting to maintain the trunk as perpendicular as possible to the ﬂoor, eyes focused ahead, and feet ﬂat on the ﬂoor. Cue: Slowly lower the body by flexing the knees. Isometric and isotonic exercises: May be beneficial for strengthening of the main muscle groups of the trunk, which stabilizes the spine and it can also decrease the pain. Through core strength training, patients with chronic low back pain can strengthen their deep trunk muscles. The patient needs to learn to activate the transversus abdominis muscle and at the same time to breath normally during the exercise. Palpation can give him/her feedback. The next step would be a co-contraction with the multifidus muscle and the pelvic floor muscles. When the patient has a good performance of this exercise, the physical therapist could combine the exercise with movements of the arms or legs. With a crossed leg syndrome type of problem, it’s beneficial to stretch the tightened muscles. For improving the mobility, the patient could perform stretching of the hamstrings, hip flexors, and lumbar paraspinal muscles over 15 seconds. This will improve the active and the passive ROM in the lower extremity. Hold-relax stretching of the iliopsoas: It can reduce back pain, excessive lumbar lordosis angle, lengthen the iliopsoas and increase transversus abdominis activation capacity. The patient lies in Thomas position, the not stretched leg is maximally flexed to stabilize the pelvis and flatten the lumbar spine. The other leg is in a normal flexed position because of the tightness of the M. Iliopsoas. It’s this leg that needs to be pushed against the table. If you want to stretch the M. rectus femoris, bend the knee more than 90°, while performing the same stretch. The stabilization exercises may be beneficial for reducing pain and disability. Patients following a supervised spinal stabilization exercise program show higher pain reduction compared to patients following another exercise program. During external perturbation, there is a decreased anterior-posterior displacement. Sling exercise training seems to be effective at reducing the pain intensity and disability levels of LBP patients. The patient is suspended in a system of pulleys. He/She has to move the arms or legs, while he/she keeps the spine in a neutral position. Both the deep and superficial muscles need to contract. The patient can also put only his feet in the sling while he can perform some bridging exercises. In subacute low-back pain, there is some evidence that a graded activity program improves absenteeism outcomes, although evidence for other types of exercise is unclear. In acute low-back pain, exercise therapy is as effective as either no treatment or other conservative treatments. With regard to lumbar hyperlordosis and based on all these studies, it can be concluded that it is not reasonable that there is a relationship between lumbar pain and the size of the lumbar lordosis. However, more research is needed in this area because the evaluation of the lumbar lordosis curve still belongs to one of the routine physical exams.